Whatever your dental issue, it is our priority. With 30 plus years of experience the personalised service and care you will get from me will differ from other dentists. Our dental centre focuses on emergency pain relief, broken fillings, root canals, extractions, wisdom teeth, bleeding gums, including hygiene and hygienist treatments. We take an holistic – scientific approach to all our treatments using biocompatible materials for our white cosmetic fillings, crowns, bridges, dentures and tooth whitening. My focus is creating smiles, wellness, health, healing and oral fitness. I create individual, personalised plans to empower my patients with the knowledge they need to heal and improve the health of their lifestyles. To me dentistry isn’t just about surgery, it’s about improving people’s diet, habits and health so that they can be orally fit. So I’m kind of a dental life coach or a dental fitness trainer. 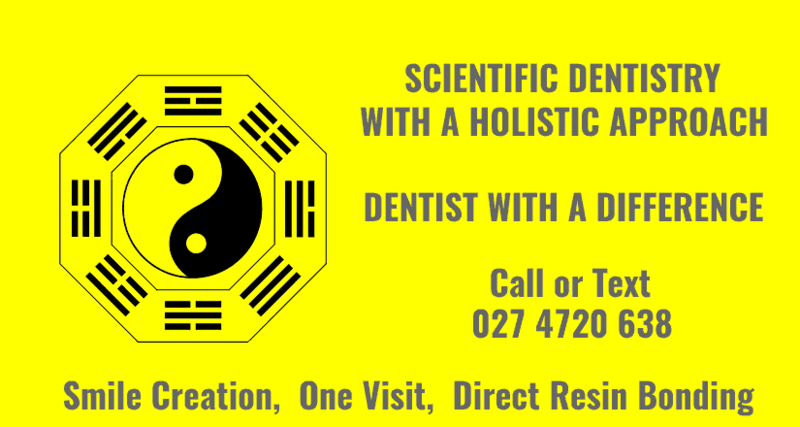 I provide holistic, scientific, advanced Dental artistry techniques which are also more cost effective than more expensive surgical solutions. My dental centre is right next door in the carpark behind the Four Square, and the best way to get a hold of me is to text me, my mobile number is on my cards and on the website. My slogan is Dentistry with a Difference. I’m easy to find. There’s a sign in front of the Four Square carpark saying Angela Lowe-Ho Dental Centre. If you walk into the carpark I’m at the back, to the right. There’s a big metal yin-yang sign in front of my office window. I have glass doors. I hope some of you come to visit me. In Dentistry every person is unique in terms of in what they need and desire. Angela endeavours to have clear communication so that your main priority and concerns are always dealt with when you have a Dental visit. Angela Lowe-Ho was the first NZ-born Chinese female to graduate from the University of Otago Dental School and set up in private practice. Since then she has avidly undertaken advanced dental professional development courses and has served on a number of Auckland Dental Association committees. Our focus is on understanding your fears, listening to your dental concerns and problems and offering you scientific and holistic options. We practice full range Dentistry. Our carefully designed systems ensure that you always receive excellent Dentistry including maintaining and enhancing the strength of your remaining tooth structures. Angela focuses on needed periodontal or gum treatments, biofilm balance, scaling, polishing, bleeding gums, sensitive or broken teeth, as well as aesthetics, appearance including smile design, straightening teeth if needed, and giving you orthodontic options and solutions. Relief of pain, discomfort and infection are priorities. Our fillings, restorations, crowns, bridges, dentures, and root canal treatments use safe and bio-compatible materials. We also do extractions and wisdom teeth removals as required. Healthy teeth need to have healthy gums and supporting structures. We will give you a personalised strategy program, including proper hygiene care, dietary and lifestyle strategies. Angela has taken her experience and incorporated solutions and strategies which empower and encourage her patients toward health, wellness and optimal function. She can help you make lifestyle and dietary changes which will improve your oral and overall health. Often an aesthetically pleasing appearance and smile is requested and required. For the last fifteen years, Angela has used minimal intervention, reinforcement and Dental artistry skills to build crowns, bridges and smiles. Dental diseases are lifestyle diseases so if you have a dental problem e.g. pain, bleeding gums, broken filling, or a wisdom teeth infection, or if you just really want to stay well and healthy, ring Angela and check us out. To empower, coach and use individual, personalised , biocompatible solutions and treatments. We believe shared decision making, knowledge and lifestyle improvements create the best holistic and scientific outcomes for our patients. If you have a dental problem, Call Me! Client parking at the front door.